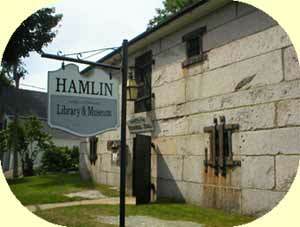 The Trustees of Hamlin Memorial Library and Museum are dedicated to the preservation of this unique granite building, the original 1822 Oxford County Jail, located on historic Paris Hill, Maine. Inside, in addition to a small circulating library that has served this community continuously since 1902, you will find an interesting and varied collection of items, including a growing archival collection, relating to early Paris history. We are pleased to be able to share this historic treasure with web viewers.